No Fenders -Formula 1, IndyCar and A Whole lot more..: F1: South American squabble? 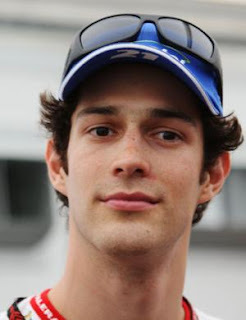 Prior to the start of this year’s Grand Prix season, I had an entertaining conversation with Indiana Bureau Chief Daniel Banes Cooper who inquired is Bruno Senna simply living off of his Surname? And what are his credentials to merit his inclusion into Formula 1. And thus, it seems somewhat fitting that I’m finally posting the story on Friday the 13th; Hya! Fernando Alonso; Jenson Button; Lewis Hamilton; Kimi Raikkonen; Michael Schumacher; Sebastian Vettel. Heikki Kovalainen; Felipe Massa; Mark Webber. Thus my immediate reply was that Bruno has won races in the Ferrari Challenge and GP2 - along with finishing runner-up to 2008 GP2 Champion Giorgio Pantano, who has not been seen since trying to kick start his Open Wheel Racing career in Indy Cars in 2011 with a few paid outings... As Pantano was trying to make the switch a la ‘Rubino this year - so I’m not sure how much of an endorsement that is for Senna? Yet don’t get me wrong, I’ve liked Bruno since his GP2 days and it’s not like he exactly had decent machinery to contest his rookie campaign in Formula 1 when struggling behind the wheel of the Hispania. Nor was last seasons replacement drive at Lotus-Renault GP spectacular. Yet once again they had the only fire breathin’ front exhaust blown chassis on the grid - which the team has gleefully discarded this year and thus, I’d haveda say the verdict’s still out upon the young Brazilian. Yet Danny’s question strikes me as funny, since why didn’t he question Venezuelan Pastor Maldonado’s involvement - who’s seat at Team Willy comes courteous of his countries national Oil company PDVSA - who reportedly have written the biggest cheque amongst the known “Paying” drivers - as I’d assume there are others on the grid who’ve needed to bring some sort of personal finances along? And I’m a huge fan of both Sergio and Felipe, having liked the latter since his Sauber days prior to becoming DER TERMINATOR’s (M. Schumacher) teammate at Ferrari. Yet, does one race simply make a driver? As it’ll be entertaining to see how the young Mexicali does in Shanghai, eh? Albeit Perez seems to be more masterful with conserving his Pirelli rubber then Massa does. And while many have purchased their ways into the sport, I still suggest that even a paying driver needs to have the requisite skills to pilot said Landsharks or they’ll be nothing more then footnotes in Grand Prix history, and can even prove detrimental to their teams long-term viability. As how many F1 Constructors have crashed ‘N burned do to the inability of these paying chauffeurs to score points whilst crashing exorbitant amounts of machinery?